Waves offshore of Coffs Harbor at 80m depth have been recorded by MHL for a period of over 30 years. Long waves have been simultaneously measured in the harbor over a period of a decade. This data enabled the model to be verified on two dates (4/6/12, 5/9/14) when high long wave was recorded in the boat ramp harbour under storm and non-storm conditions. Long waves are generated in harbours due to group bounded long wave and surf beat or edge waves. The paper presents examples of field data of extreme seiche waves measured at Coffs Harbour over a period of a decade by MHL and describes the generation and measuring methodology to detect and reduce seiche agitation in the Coffs Harbour boat ramp. The paper also discusses the techniques in investigating a short wave problem of stability in the same model where a long wave is simulated. The paper presents methodologies of generating long waves both numerically and by using physical models and discusses the advantages and disadvantages of these generation techniques. 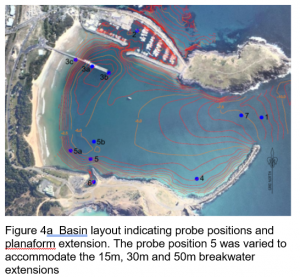 Numerical modelling carried out using long period regular waves in a previous investigation predicted reductions up to 50% due to change of planaform of the boat ramp harbour. The 3D physical model simulated a 25% decrease in the long wave energy in the boat ramp when a suitable change in the planaform was made. A 3D undistorted model of scale 58 was used in the investigation. 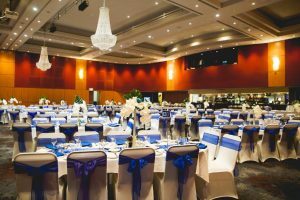 Coffs Harbour is situated on the mid-north coast of New South Wales approximately 600 kilometres north of Sydney. The harbour was created by linking two offshore islands by breakwaters and filling a causeway. Harbour works commenced in 1914 and were completed in 1974. In port and harbour engineering, the term seiching is normally used as a synonym for long period wave oscillations in harbours. Long period waves are characterised by wave periods of, say, 0.5–30 minutes. 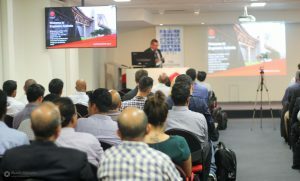 NSW Public Works Manly Hydraulics Laboratory (MHL) was engaged by Coffs Harbour City Council in May 2014 to undertake a review of reporting on numerical modelling completed by Water Technology  on strategies to reduce wave seiching at the boat ramp at Coffs Harbour (Figures 1, 2a and 2b). A 3D undistorted physical model of scale 1:58 was utilised to verify the numerical modelling results. Long waves are generated due to group bounded long wave and surf beat or edge waves , and  and could include influences of the East Australian current and density stratifications. Long waves propagating in coastal areas can amplify in semi-enclosed basins such as harbours and lagoons. This occurs when the period of the incident wave is similar to the period of the forced oscillation, i.e. under resonance conditions. 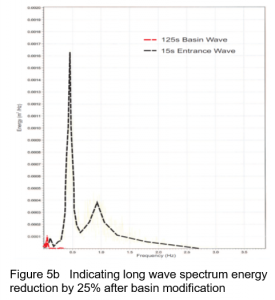 In the physical model long waves were generated using (1) an impulse function similar to that simulated in the breakwater modelling ; (2) a 125s Jonswap spectrum was used to force the simulation of seiche in the boat ramp; and (3) group bounded short waves and/or surfbeat. Short waves offshore of Coffs Harbour at 80m depth have been recorded by MHL for a period of over 30 years. Long waves have been simultaneously measured in the harbour over a period of a decade (Table 2.1). This data enabled the model to be verified on two dates (4/6/12, 5/9/14) when high long wave was recorded in the boat ramp harbour (Figures 2a and 2b). Repair and maintenance issues associated with seiche energy within the harbour have been recognised previously . This included the fact that within the harbour seiche could occur on days of both high and low offshore wave activity. Subsequent to verification, the model long wave agitation was reduced in the boat ramp harbour by 25% using a change of planaform. 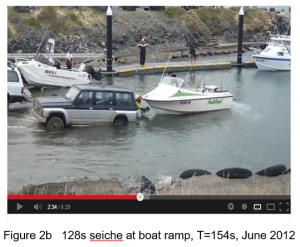 Numerical modelling carried out in a previous investigation predicted reductions up to 50% due to change of similar planaform of the boat ramp harbour. Table 1 provides a history of long wave measurement in Coffs Harbour. A sample of the highest long waves measured during 1988–1992 is indicated in Table 2. The table indicates that seiche periods of approximately (depending on the parameters of the FFT) 712s, 138s, 109s, 66s and 62s were detected inside Coffs Harbour. The length of record is approximately 50 minutes. These 700s waves are also mentioned in a published paper , where the coincidence between storm waves (Hs>4.0m) measured offshore of Coffs Harbour and high long waves (Hmax>0.6m) inside the harbour was noted. However, it was also noted in this that on several days high long wave activity was recorded when no offshore storm waves (Hs<3m) were recorded. A previous physical model study on seiche in the harbour (MHL 538 Figure 3a) identified a 136s and a 216s long wave recorded at the jetty during the period July 1987 and March 1988. 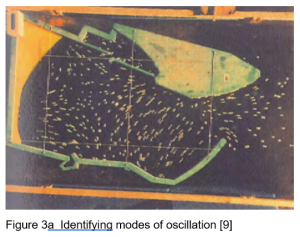 3D physical modelling was carried out at MHL  (Figure 3a) in order to identify seiche modes. This modelling was carried out at very large scales (H=1:800,V=1:100) as there were no associated short wave problems to be solved in the model and the criteria for accurately simulating diffracted waves was not critical. 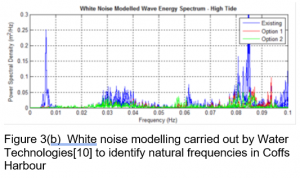 Water Technologies carried out white noise simulation (Figure 3b) to identify long wave periods that resonated in the harbour at 160s, similar to numerical modelling that had been carried out by Koefod-Hanson . Bowers  used a Stokes expansion to obtain a relationship relating the significant height of a measured long wave (Hsl) to the forcing mechanism generating the long wave. 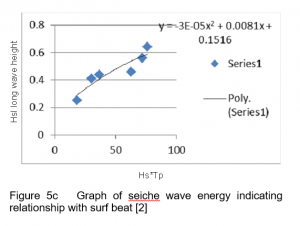 If the long waves at the site are more bounded wave-group dominated then it could be assumed that Hsl ~(HsTp)2, whereas surfbeats with unbroken grouped waves reflecting off harbour beach are more likely to be ~(HsTp). The eight lowest modes of oscillation for a closed rectangular basin were calculated using a basin length (l) of 1125m, a basin width (b) of 625m and a basin depth (d) of 8m for Coffs Harbour and a length of 70m, a width of 40m and depth of 1.5m for the boat ramp basin, and are given in Table 3.
compare the results of the seiche activity for the existing boat ramp basin and the Option 2 basin extension layout to determine the reduction in seiche activity provided by the extended boat ramp basin configuration. Several investigations have provided indicators of the limiting size of models for reduced Reynolds number effects or scale effects  . 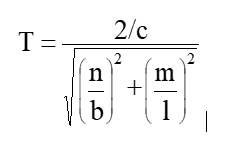 More recently Cornett  determined a condition for negligible scale effect. A length scale of 1:58 was selected for the Coffs Harbour 3D physical model. The scale is determined considering the dimensions of the structures to be modelled, the requirement to model armour stability, water levels, wave heights and the need to minimise scale effects in a model that requires adequate model dimensions to measure the small wave heights simulated in the model. The time scale was determined from the length scale using Froudian similitude. The mass scale allows for the differences in density between sea water in the prototype and fresh water used in the model. The Hudson methodology was utilised to obtain the mass scale (Hughes ). A comprehensive discussion on scale effects in models and measurements required to mitigate these errors is provided in Hughes . Scale values that resulted in Re numbers greater than 20,000 were selected in order to satisfy Cornett’s  criteria when testing the stability of 4 tonne rock armour to minimise scale effects in the physical model investigations. Table 4 provides details of tests carried out at two water levels and indicates a 23%-29% reduction in Hsl due to change in planaform of boatramp basin. A simplified rectangular model indicates that the planaform of Coffs Harbour has the dimensions to resonate at periods 120s–130s. Historic field data collected at Coffs Harbour for a decade indicates that both bounded waves caused by high offshore waves and surf beat or edge waves resulting from smaller wave groups reflecting off harbour beach may result in seiche periods of 120s–130s within the boat harbour. 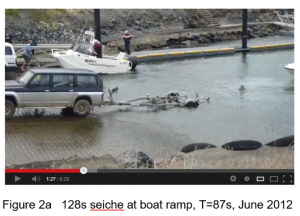 Impulse function testing (white noise) and testing with a 129s Jonswap spectra gave rise to a 100s to 150s wave in the boat ramp. Water levels conditions at 0.0m AHD and 0.8m AHD were tested with 12s–15s Jonswap spectra which included the offshore conditions recorded in June 2012 and September 2014 at which time a 125s seiche was observed in the boat ramp harbour and was used to verify the model. The model was undistorted and the scale was 1:58. Testing of the above conditions with basin modified to increase friction resulted in less than 30% reduction in long wave energy in the modified boat ramp. 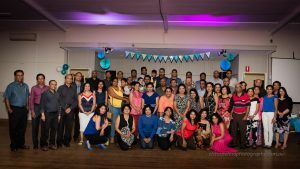 A reduction of greater than 50% as forecast by the numerical modelling was not observed. Stability testing of the 15m, 30m and 50m breakwaters utilising 15s 6m waves at the entrance resulted in low damage to the 4 tonne armour. The 50m extension (5° to north) did not provide added protection when compared to the original testing that was carried out at 335°. 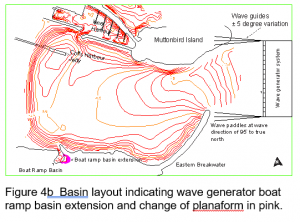 The breakwater extensions in general did not result in any significant long wave attenuation within the boat harbour. 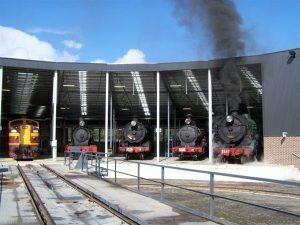 The authors wish to thank Manly Hydraulics Laboratory and Coffs Harbour City Council for permission to utilise data from published reports. Baldock, T.E. and Huntley, D.A (2002). Long–Wave Forcing by the Breaking of Random Gravity Waves on a Beach, Proc. Royal Society, London. A Vol, 458, 2177-2201. Bowers, E.C (1992). Long Period Disturbance Due to Wave Groups, Proceedings 23rd Int. Conf. Coastal Engineering Vienna pp832-845. Cornett, A. (1995). A Study of Forcing and Damage of Rock Armour on Rubble Mound Breakwaters, PhD Thesis, Technical Report HYD-TR-005, National Research Council, Canada. Dean, R.G. and Dalley, W.R (1986). Transformation of Random Waves Breaking on Surf Beat – 20th ICCE Conference, pp109-123, New York. Hughes, S.A. (1993). Physical Models and Laboratory Techniques in Coastal Engineering, Advanced Series on Ocean Engineering. Volume 7, World Scientific. Jayewardene, I.F.W., Rangger, R. (2001). Repair and Maintenance Issues Raised by Short and Long Wave Disturbance Inside Coffs Harbour, 15th Australasian Conference on Coastal and Ocean Engineering, Institution of Engineers Australia, Gold Coast, September 2001. Henrik Kofoed–Hansen, Kerper, D.R., Soresen, O.R. and Kirkegaard J. (2005). 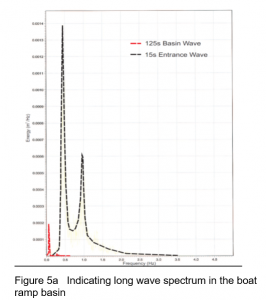 Simulation of Long Wave Agitation in Ports and Harbours Using a Time Domain Boussinesq Model, Proceedings of Fifth International Symposium on Ocean Wave Measurement and Analysis, WAVES 2005 Madrid, Spain. Manly Hydraulics Laboratory (1989). 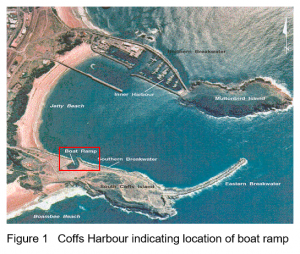 Coffs Harbour Seiche Study – A Physical Model Study on the Existing Harbour and Field Data Review, Manly Hydraulics Laboratory, Report No. 538, November 1989. Water Technology/Geolink (2014). Coffs Harbour Boat Ramp Basin Improvement Design, Water Technology/Geolink Report 2954-01/R01, January 2014.